Last year I had a pretty primitive system of rainwater collection and storage, just four garbage cans and five-gallon buckets for collecting rainwater. This year I’ve advanced considerably, with three rainwater catchment barrels in place and a fourth ready to be chained into the system. 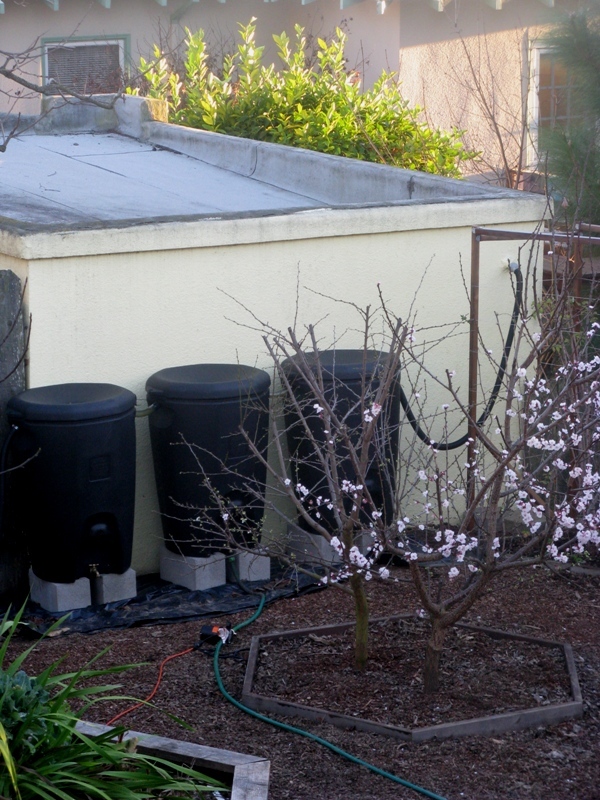 For more on this year’s new setup, see my earlier post, My rainwater catchment system. Now that I’m collecting more water, and collecting it on the lowest part of my property, I’ve been wanting to figure out a better system for using the water and moving it to where it is needed. A friend came by a few weeks ago to see my setup and told me how he moves around his laundry grey water. He has a small pump, a Simer M40, that I liked because it has two hose bibs, making both input and output easy to use in the garden. I found one used on eBay and it arrived today. With warm weather the past week and wind on top of that, I needed to irrigate. Plus, we have a storm coming in next week and I want my catchment barrels to be empty and ready to collect more rainwater with the next storm. So, I tested out the pump, both for irrigation and to empty out the barrels. 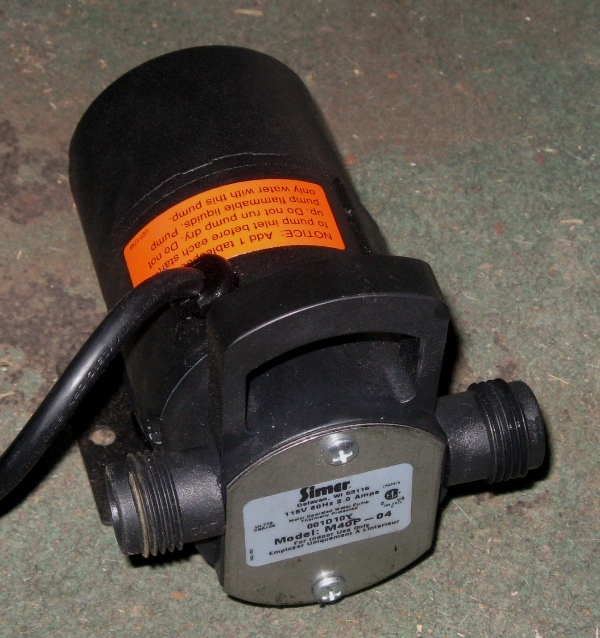 The pump is small, so it doesn’t put out a lot of pressure. But, there is enough pressure to hook up my hose and water my plants. The real test came when I moved over two catchment barrels of water to garbage cans elsewhere in my yard. The pump was slow, taking 12 minutes to fill each garbage can and drain half of a catchment barrel. But, it worked and I was able to do other yard work while the transfer took place. I now have 130 gallons of water stored in garbage cans and will have capacity to collect another 260 gallons of water with the coming spring storms. I like this setup! I’m thinking I might even get another container, a 200 gallon surplus food container, to put under my front window, then I can store water to irrigate my front yard once or twice during the summer. 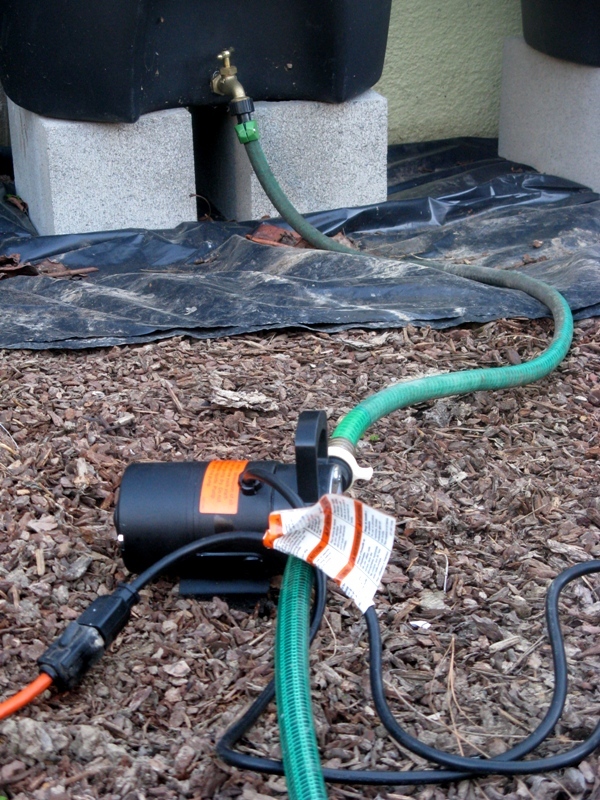 The pump could be used to move rainwater from a collection site to that tank.